With four distinct seasons, well-preserved traditional culure, and cutting-edge technology, Japan is recognised not only for its hospitality (omotenashi) but also for its high-quality "Made-in-Japan" goods. The culinary culture in Japan also garners attention for its dynamicism and rich history from chefs around the world. Le Cordon Bleu Japan has campuses in Tokyo, known for 3-star Michelin restaurants that rival those in France, and in Kobe, a central city in historic Kansai, the cradle of Japanese cuisine. These two global food cities attract the world’s top chefs and are vibrant hubs of culinary trends and talent. Experience this exciting country while receiving an international-level culinary education in the language you prefer: Japanese, English, and Chinese. The schools also provide a number of other culinary programs and classes (Professional Series, Sabrina, Debut) geared toward both seasoned culinary professionals, graduates, and beginners alike. Additionally, special exclusive-to-Japan culinary classes are also available for students to fully take advantage of their time abroad. The campuses of Le Cordon Bleu Japan are located in Tokyo and Kobe, cities where global culinary cultures converge. The Tokyo campus is situated in Daikanyama, a quiet upscale district in the heart of bustling Tokyo. With tree-lined avenues and foreign embassies, Daikanyama is appreciated as an urban oasis for its fashionable boutiques, trendy cafés, and gourmet restaurants. The Kobe campus is located in the city of Kobe, a historic port city well-known for its unique internationalism. With architecture reminiscent of an epoch past and nestled between mountains and the ocean, Kobe is also a famous tourist destination. Le Cordon Bleu offers trial experiences such as actual classwork, orientation fairs, and private consultation for prospective students. Orientation fairs are open-houses held at the schools where prospective students are provided detailed descriptions of courses and facilities, and small group tours of demonstration and practical classes (Cuisine, Pâtisserie or Boulangerie). Please apply to attend a fair using the contact form of the campus of your choice. Le Cordon Bleu instructors are chefs with experience in first-class hotel kitchens, Michelin-star restaurants, and top-notch pastry shops and bakeries. These select chefs not only have excellent practical techniques but are capable of explaining the theory behind their own skills. 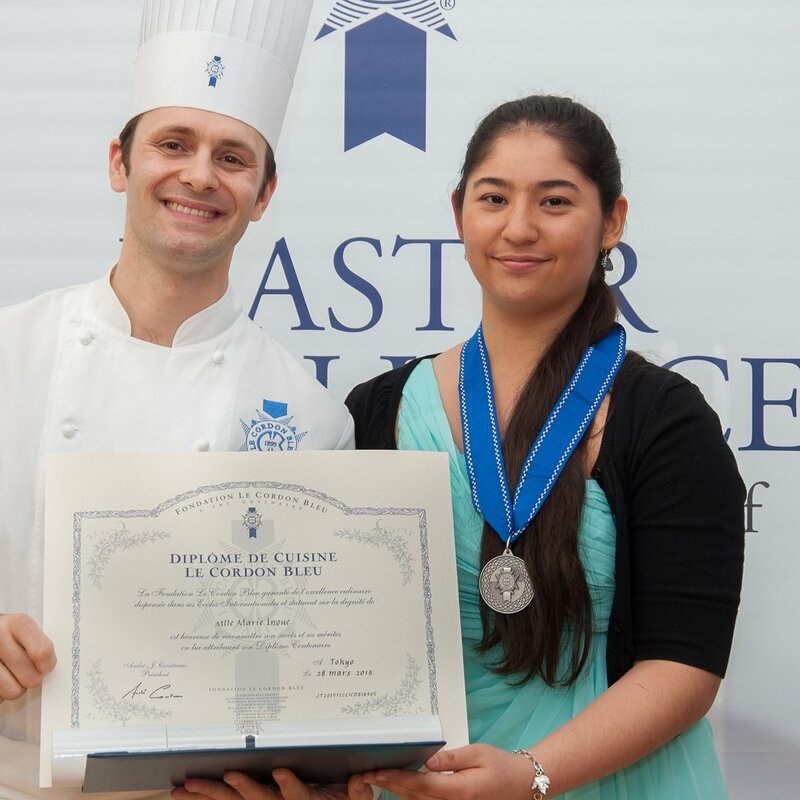 Following the philosophy of Le Cordon Bleu, students have abundant opportunities to learn “ultimate excellence” and the importance of blending sensitivity, boldness, passion and constant challenge through guidance from these first-class chefs in both theories and practices. The instructors at our schools in Japan also include Japanese chefs and pastry possessing both rich experiences in France and particular sensitivity of Japan, thus providing the best environments to learn French culinary arts in Japan. For academic programs that provide experiences of French cuisine and cultures, we invite special instructors from particular fields to further enrich our students’ learning opportunities. Le Cordon Bleu Japan collaborates on a range of goods from food products and ingredients to cookware, kitchen appliances, and household accessories. Applying our technical and commercial savvy, we provide a number of support services for our collaborators, including product development, product promotion, event staffing, chef-led lectures and demonstrations, and recipe development as well. Additionally, Le Cordon Bleu offers consulting services for restaurants, cafés, and other food service related businesses. We also provide our expertise in areas such as menu creation, cuisine instruction, event planning and operations.